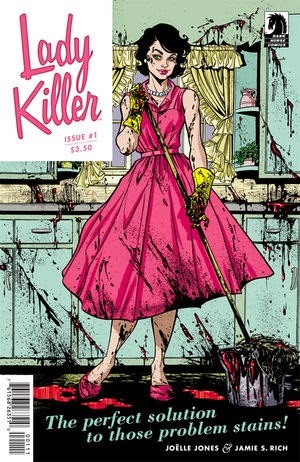 The Fellowship was fortunate enough to obtain a copy of LADY KILLER #1 from Dark Horse Comics. Joëlle Jones and Jamie S. Rich write, Jones draws and Laura Allred colors. Josie has a great life. She’s got a loving husband, great kids, and a nice house in the suburbs. She’s also does a little work on the side – as a contract killer. But now she’s going undercover in a most unsavory place in order to fulfill her next contract. And this job is going to rattle her 1960s sensibilities to her core. The combination of humor and violence can be tricky, but this book pulls it off wonderfully. Josie is very good at her job, and her family is a great source of laughs. I suspect the next issue will be loaded with comedy too. Anyway, there are several story elements working together here, and it’s a lot of fun. The art captures the style of the early 1960s, and not just in the clothing; the whole thing just really feels at home in that era. Is she a housewife, or is she an assassin? Or can she be both? We’re going on a heck of an adventure to find out, and maybe we’ll learn even more about Josie. Pick it up today. LADY KILLER #1 is available now at your FLCS or at darkhorse.com.